Miracle formula for fast, easy ball repairs; sets up instantly! By cth6289646 from Suisub City Ca. 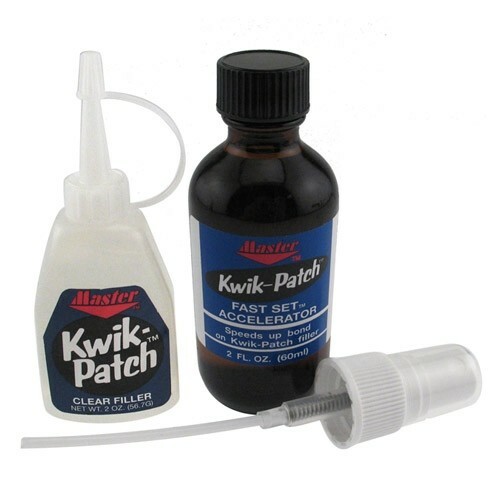 Use the Qwick Patch slow acting super glue and rub it into cracks with impervious material like plastic coated paper remove any major ecess glue it does not setup quickly you have time. 2 Spray on activator. Then as suggusted sand down material left on top of suface of ball or use a small amount of acetone to very carefully remove excess material, Q-tip or small towell (very little or you damage your original crack repair). Cracking stops after use of product. Clean Ball with the suggested cleaner/ polish and use bowling ball normally. Best thing I have found to repair small cracks in surface/ coverstock without major repairs that have to be done by Proshop and can be done in minutes, not hours or days. Due to the time it takes to produce the Master Kwik Patch Kit ball it will ship in immediately. We cannot ship this ball outside the United States.